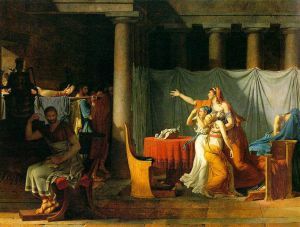 Jacques-Louis David (30 August 1748 – 29 December 1825) was a highly influential French painter in the Neoclassical style, considered to be the preeminent painter of the era. In the 1780s his cerebral brand of history painting marked a change in taste away from Rococo frivolity toward a classical austerity and severity, heightened feeling chiming with the moral climate of the final years of the ancien régime. David later became an active supporter of the French Revolution and friend of Maximilien Robespierre (1758-1794), and was effectively a dictator of the arts under the French Republic. 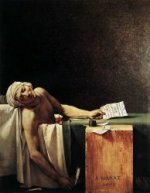 Imprisoned after Robespierre's fall from power, he aligned himself with yet another political regime upon his release, that of Napoleon I. It was at this time that he developed his 'Empire style', notable for its use of warm Venetian colours. 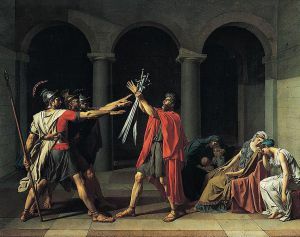 David had a huge number of pupils, making him the strongest influence in French art of the early 19th century, especially academic Salon painting.